List: From an open source eBay competitor to accelerating cryptocurrency development. Bitcoin and other blockchain technologies are really taking off, with interest in them peaking recently with 40 global banks including Barclays and HSBC running trials with smart contracts to see how they can be used on a global scale. As the technology takes off, CBR identifies five companies that will have a significant impact on the industry through 2016. The company is working on the development of a decentralised marketplace for bitcoin. If successful this would create an open source competitor to eBay. To compete it would offer reduced fees for all parties involved due to the decentralised nature of the technology. Challenges still face the company such as launching and including the development of a robust reputation system, but the biggest problem is perhaps the challenge of building volume in a new marketplace. To help meet these challenges the company raised $1m in venture capital fundraising in June 2015 which will help to launch OpenBazaar sometime in 2016. The bitcoin powered social media platform has integrated on-chain bitcoin micropayments that can be used for tipping. This idea is something that the company says isn’t being done elsewhere and will help to create high-quality user engagement along with content creation among self-created communities. Hurdles lie ahead in the form of being able to avoid spam users and also in its ability to grow. Growth in non-bitcoin related communities is expected of the company while it is also predicted to become one of the top bitcoin news platforms. Zapchain launched back in March last year and it allows users to build communities. To help it grow the company raised $350,000 in seed funding in November 2015. This is a blockchain identifying and notarising service that recently announced a deal with the Estonian government. Bitnation says that it provides the same services that traditional governments provide, from dispute resolution and insurance to security. The decentralised governance project offers blockchain IDs and Bitcoin debit cards to regugees. The company has said that the project aims to eradicate the most criminal part of existing legacy systems – borders. The ambitious project provides DIY governance services and has been given attention for its help with providing refugee emergency response and world citizenship ID on the blockchain. The interestingly named gaming company is a platform that uses blockchain technology to create a transparent and legitimate secondary market for items that have in-game value. The value in this is that some in-game items can be worth hundreds of pounds. Basically the idea behind this is to give users more control of their virtual property, allowing them to buy, trade and sell items that they no longer need. The company has said that it is going to change this problem and enable them to trade their virtual junk, which is where Vunk comes from, all through digital wallets. The hope is that this means that gamers won’t have to navigate shady forums and use PayPal accounts to trade items. This in the past has lead to users having their accounts frozen and on more that one occasion losing out to criminal activities. The company has built and is continuing to build tools and plug-ins that will allow for seamless blockchain integration. By doing this the company allows for issuing and tracking virtual assets in-game. 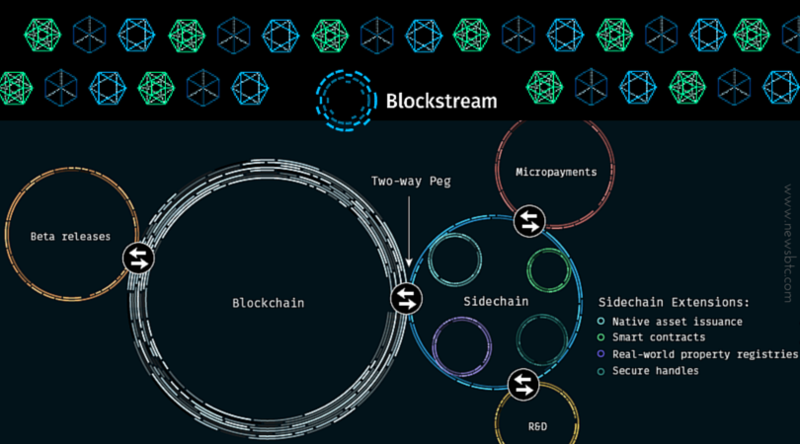 Blockstream has described itself as a stealth Bitcoin company that is working on accelerating the development of cryptocurrency, open asset and smart contract technology. Smart contracts are computer protocols that facilitate, verify, or enforce the negotiation or performance of a contract. They have recently been tested by 40 global banks, as mentioned above. The company has launched a beta of its sidechains project and also announced Liquid, which will be its first commercial product and will be aimed at speeding up transfer times between Bitcoin exchanges. In addition to this the company has been working on the Lightning Network. The idea behind this is the ability to move smaller Bitcoin transactions off the blockchain, essentially maker them occur more quickly and with reduced fees. The Lightning Network has the potential to reduce the total number of transactions that need to be settled on the Bitcoin blockchain. The benefit of this is that it removes their affect on the necessary total size of blocks, an issue which is being debated in the community. Challenges for the company include that of integrating various changes to Bitcoin Core, something that requires a great deal of agreement among a growing community that may be afraid of changing anything for fear of diluting the founding principles of the technology. Next ArticleDevice wars: Will the Galaxy S7 revive fortunes for Samsung’s smartphone business?